The Creation SuperLibrary is a non-profit, educational, cooperative ministry -- part of the highly popular Christian Answers Network. Information in the Creation SuperLibrary is primarily supplied by its Team Members and staff, Christian organizations generously working together to help others. Its mission is to produce and freely provide high-quality material on Creation/Evolution for seekers and searchers. 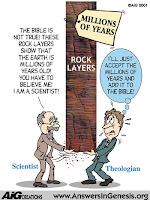 Creation Science Evangelism began in 1989. CSE's speakers are some of the most requested on the creation and evolution topic in churches and universities all over the world. With over 30 years of research in Biology, Anatomy, Physical Science, Mathematics, Earth Science and many other sciences, CSE has become a trusted source of information in the creation versus evolution debate. Mirror site, click here.